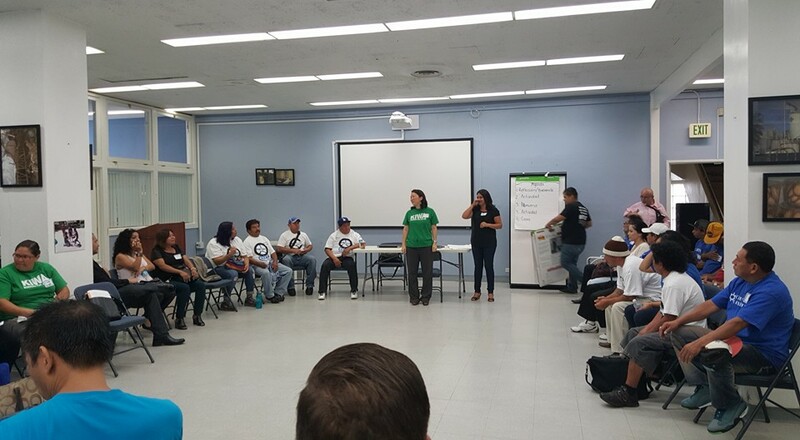 On August 18th, the Los Angeles Coalition Against Wage Theft held a worker assembly to review the new law they won with coalition members and to plan for next steps. Starting in July of 2016, the cities minimum wage will increase in increments until 2020 when the full $15 an hour will take affect. In addition to the minimum wage, Mayor Eric Garcetti signed into law an ordinance passed by the City Council to establish an Office of Labor Standards. The office will fund investigators and outreach efforts to ensure businesses are paying workers and to put an end to wage theft. The assembly looked back at the history and work accomplished by the coalition, and committed itself to ensuring that the city fully support and fund the Office of Labor Standards. 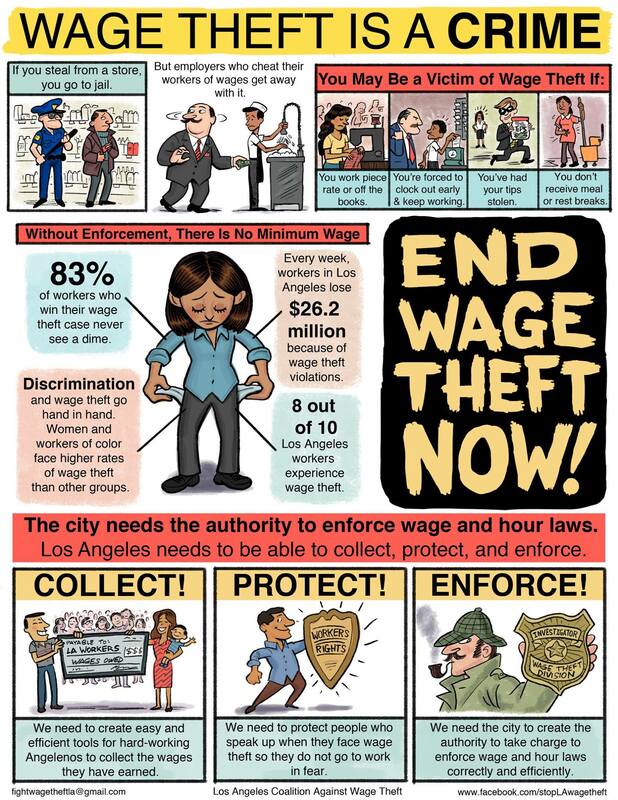 Spurred by the release of a national survey of 4,387 workers in low-wage industries in Chicago, Los Angeles, and New York City in 2009 finding that 60% of workers are underpaid by at least a dollar an hour, the Los Angeles Coalition Against Wage Theft was formed. The study showed that workers in Los Angeles were robbed of $26.2 million dollars every week. This laid the groundwork for the National Day Laborer Organizing Network and the UCLA Labor Center to lead an action at the LA City Council to take up a motion to draft anti-wage theft ordinance language. At the time there was little to no follow through from then City Attorney Carmen Trutanich. Needing further support and momentum, the campaign expanded to include those doing similar work to fight wage theft, including worker centers, day laborers in construction, domestic workers, security guards, valet parking attendants, warehouse, garment, retail, carwash, and restaurant workers. From 2010 through 2012, coalition members organized worker assemblies for partner organizations to come together and develop a campaign strategy, along with policy tools that would strengthen enforcement of wage and hour laws. All the while, coalition members continually supported each other each other’s individual wage theft campaigns. One of the major victories accomplished with the support of the coalition came in 2014, when KIWA (Koreatown Immigrant Workers Alliance) helped make a wage claim for Heriberto Zamora, who was unjustly fired from famed sushi restaurant Urasawa. Owed thousands of dollars in over time pay and being force to work while sick, Heriberto’s win helped set a precedent that began turning the tides and momentum in favor of the coalition. Looking to continue moving forward with the momentum from recent wins, the coalition began working with SCOPE Training Director, Gloria Medina to facilitate meetings and use SCOPE’s power analysis training with the coalition. By identifying decision-makers, key influencers, and community members the coalition was able to continue building power and momentum to move forward. 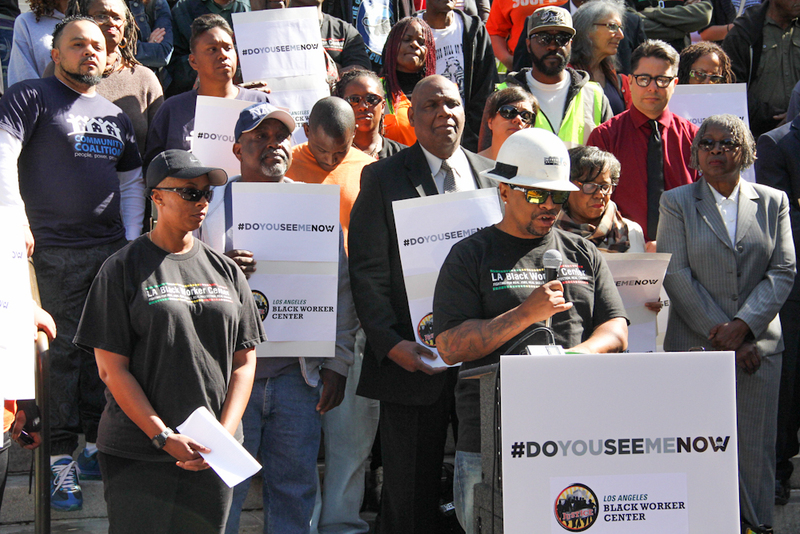 The resurgence was a boost workers needed to continue fighting and moving forward after years of commitment to the coalition and frustration with the bureaucracy of the LA City Council. In the midst of the coalitions work, LA Mayor, Eric Garcetti, made his own independent announced to raise the cities minimum wage. The surprise announcement kicked off a joint alliance between worker centers and labor unions to take advantage of the momentum created by the mayor and make an impact at city hall. As 2014 came to a close, the gears at the city were slowly grinding away as the city’s Economic Development Committee pushed the City Attorney, Mike Feuer, to advance the wage theft ordinance and to investigate options for a local enforcement agency. The wage theft coalition also voted to push that the future LA office of Labor and Standards Enforcement should be able to enforce workplace laws, anti-discrimination, and anti-retaliation laws following a job analysis report from the Black Worker Center. 2015 saw the launch of the LA Raise the Wage Coalition to raise the minimum wage in the city to $15.25 an hour and include paid sick days for workers, along with wage theft enforcement. The Economic Development committee heard testimonials from workers from across different job sectors on how a $15 minimum wage would greatly improve their lives. While businesses opposed and testified against the wage increase, workers made their voices heard that LA can and should raise the minimum wage. Finally, on June 3, the LA city council approved the law that would raise the minimum wage in increments to $15 an hour by 2020. Signed by the mayor later that month, Los Angeles stood up for all workers struggling on a daily basis to support their families. As part of the law, the city committed half a million dollars to fund an office of labor standards that would fight against wage theft. The partnerships and alliances of the wage theft coalition bore fruit that would help workers get paid what they deserve without. Keeping the momentum going, the Los Angeles County Board of Supervisors also approved to raise the minimum wage to $15 an hour by 2020 in all unincorporated areas of the county. SCOPE is proud to contribute to and support the wage theft coalition in making the necessary inroads to push this historic legislation. Through the power analysis tool, the coalition was able to create strategies to identify and communicate with decision-makers, key influencers, and community members to further build power.